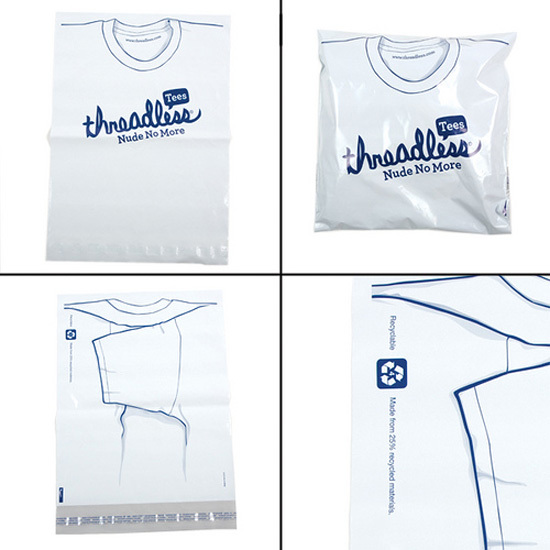 Threadless announced that they are now shipping their t-shirts in environmentally friendly shipping bags made from 25% recycled materials and they are recyclable. The bags also have a very creative design that make it appear as if the bag is actually a folded shirt so the front just shows the collar and top shoulder part of the shirt. The back of the bag shows the back of what a folded t-shirt would look like. For more information check out the Threadless blog. Once I receive one of the new bags I will add it to my list of the World’s Greatest T-Shirt Packaging. You can also check out a video of the guys making a t-shirt out of the shipping bag. DIY Threadless Shipping Bag Tee Shirt from Threadless.com on Vimeo. Threadless ships its 1 millionth order! Can you guess the prize?